You may have missed our WWI Letter Reading but it is not too late to see the many wonderful artifacts, uniforms and posters on display. All four of our exhibit cases are full of artifacts generously loaned from the private collection of Bryan Felty. 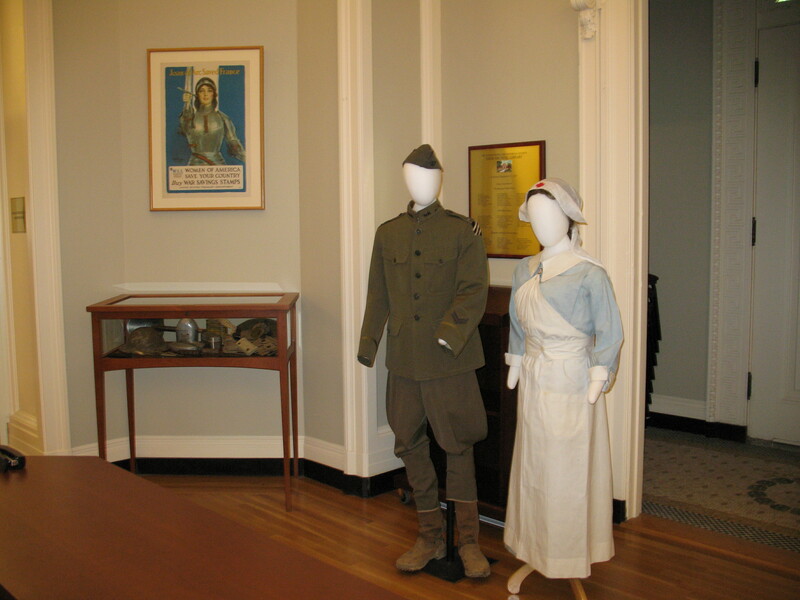 Also on display are the Red Cross Nurse’s uniform worn by Margaret Piersol Murray and the Captain’s uniform worn by Robinson Murray during their tenure in France in 1918. These items will remain on display until early June. Also, look for an online exhibit of our letter reading coming soon. ← WWI through a girl’s eyes. I am trying to find information of Capt. Robinson Murray who served with the 38th Infantry, 3d Division in World War One. Thank you. Stephen – the Drew Archives has copies (not originals) of letters written between Robinson Murray and his future wife, a nurse in WWI.